The American jeweller Jan Yager found the inspiration for her series 'City Flotsam: City Flora' in the streets around her studio in Philadelphia. Here she discovered discarded crack cocaine vials and bullet casings - 'frighteningly tangible evidence of drugs, violence and crime' which 'spoke of such immense tragedy to me'. Yet at the same time, through the determined growth of plants like the purslane, she was also struck by 'nature's resilient beauty' and survival in the urban landscape. These unlikely subjects have been transformed into jewellery striking for its subtle and calm beauty. Yager's crack vials make a historical reference to trade on the streets of Philadelphia and contemporary life and its social structures. Her early work was made of embossed gold with tactile surfaces. Even when studying at the Rhode Island School of Design it was the world around her, such as cobble stone pavements and walls which inspired her designs. 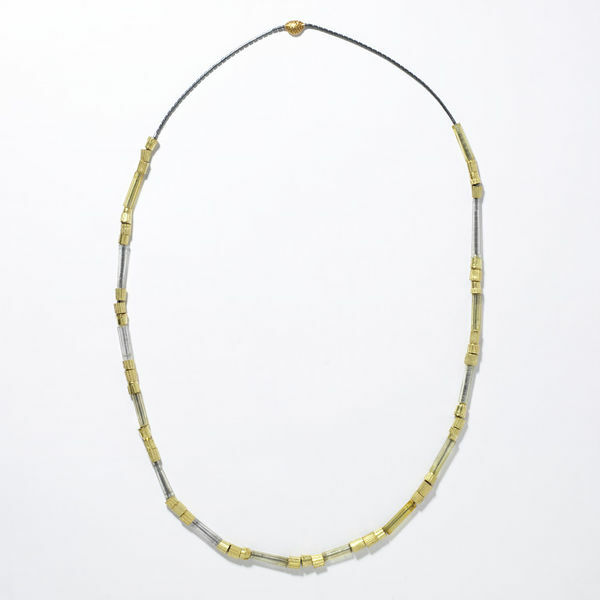 Fourteen plastic crack vials and forty-two gold castings of crack vial caps threaded on an 'oxidised' silver segmented chain. At the back a single hollow gold bead in the shape of a purslane leaf, with tyre tread textured decoration. 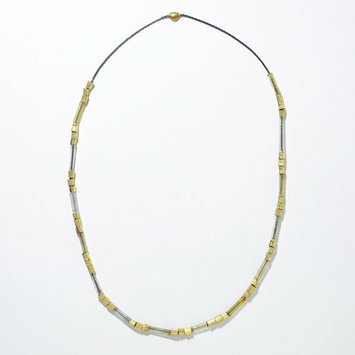 Necklace of crack vials, gold and silver, by Jan Yager, Philadelphia 2001.